Make the most of your Sunday school class time with our bulletins. A membership to Children's Worship Bulletins allows you to give your children a bulletin of their own each week, making them feel like part of the entire worship experience. By taking a few seconds to customize your bulletins with your church contact information, an encouraging message, or a logo or other image, you can make your bulletins a lasting lesson that children want to look at or work through over and over again. You can use bulletins to create engaging and relevant activities for your class as well. In this brief article, we'll show you two Sunday school activities about Ruth to get you started. Read aloud Ruth 1:1-22. After reading the story, ask the children to summarize it in their own words. Give each child the four panels of a bulletin and a pencil. Explain the activity, "We have five puzzles to solve today. I'll give you some time to work on the first four. Please complete the puzzles on each of the pages I've given to you." Next, read the titles of each bulletin panel and ask the children to either show their answer (for panels 1, 3 or 4) or read their answer (for panel 2). Explain, "To solve our fifth puzzle, we need to put the panels in the same order as the story to make a book about Naomi. Let's see if we can put them in order together." Ask the children which panel they think represents the beginning of the story. Engage them in a conversation about why their guesses might or might not be the right answer. Continue the conversation until everyone has all four panels in the correct order (i.e., "Naomi lived in Moab …," "Naomi decided to go back …," "Oprah kissed Naomi …," and "Ruth chose to stay …"). Review the story by using the panels to summarize it. Staple each child's panels together to create a book of this story of Naomi. Encourage the children to tell this story of Naomi to the rest of their family when they get home. Sunday school activity about Ruth for ages 7-12: What did Ruth say to Naomi … ? Have the children complete the puzzle "What did Ruth say to Naomi …?" After the children have completed their puzzles, ask for a volunteer to read the answer. Continue, "Let's explore the character traits of Naomi and Ruth. Who can give me one character trait?" (Accept an answer such as 'loyal'). Encourage the class to come up with dozens of synonyms for "loyal," "friend," "faithful," etc. When you have an extensive list of synonyms for "loyal," "friend" or "faithful," ask the children if they'd like to have a friend like Ruth? Why? Children's Worship Bulletins are full of relevant, fun material that you can use with your weekly services. With a membership, you'll have access to more bulletins and puzzles than anywhere else on the Web! 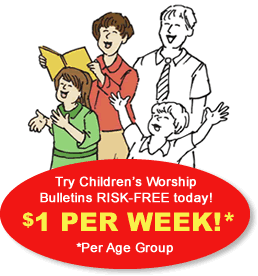 We're so sure that your children will love Children's Worship Bulletins — we guarantee it!